Indian head massage has been practised for thousands of years. It is a very relaxing treatment and excellent for neck and shoulder tension. It is especially good for relieving stress, tension, fatigue, insomnia, headaches and sinusitis. It can help migraine sufferers but only inbetween attacks, never during. Clients report that the experience is deeply calming and relaxing, leaving them feeling energised and revitalised and better able to concentrate. I start with a massage on the back and neck working deeply over the muscles and pressure points that help the muscles to relax, and continue down the arms to the fingers. The whole scalp is then massaged to encourage circulation, oxygen and nutrients to the area. The effect of this is to help stimulate hair growth and revitalise the brain. Finally, the treatment finishes with a wonderful soothing face massage, which includes pressure points and draining techniques that may help headaches and sinus problems. Indian Head massage is also used to aid the condition of the hair, particularly when combined with the use of natural organic oils. 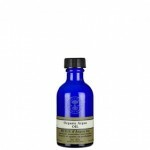 I really like this Argan oil by Neal’s Yard which is organic and intensely nourishing. It has extremely high levels of the antioxidant vitamin E.
Indian head massage can be combined with other treatments for a 20% overall discount. No Replies to "Indian head massage"